Background: Allogeneic haematopoietic stem cell transplantation (alloHCT) remains a challenge in elderly and comorbid patients with acute myeloid leukaemia (AML) and myelodysplastic syndrome (MDS). Since the introduction of reduced intensity conditioning (RIC) regimens, patients considered ineligible for standard myeloablative conditioning (MAC) are candidates for alloHCT. A prospective clinical phase III trial was conducted to provide evidence for the safety and efficacy of a newly developed treosulfan‑based regimen in comparison to a well-established RIC busulfan regimen in this more vulnerable AML and MDS patient population. Methods: Patients with AML (in complete haematological remission) and MDS scheduled for matched-related donor (MRD) or matched-unrelated donor (MUD) alloHCT, who were ineligible for (MAC) (≥50 years or HCT‑CI >2) were included. The prospective, open-label, active-controlled, randomised (1:1), group-sequential, phase III trial was designed to demonstrate at least non‑inferiority of treosulfan (10 g/m²/day i.v. d‑4 to d‑2) versus busulfan (3.2 mg/kg/day i.v. d‑4 to d‑3), both in combination with fludarabine (30 mg/m²/day i.v. d‑6 to d‑2). Pre‑ and post‑transplant immunosuppressive treatment was standardised and included ciclosporin and short‑course methotrexate; anti‑thymocyte globulin was used in case of MUD. The primary endpoint was event‑free survival (EFS) within 24 months (relapse, graft failure, or death counting for events). Secondary endpoints were safety evaluation, engraftment, chimerism, overall survival (OS), relapse/progression incidence (RI), non-relapse mortality (NRM) and GvHD. After a previously conducted confirmatory interim analysis (based on 476 patients), which resulted in early termination of patient accrual due to significant non-inferiority of treosulfan versus busulfan treatment (Beelen et al., EBMT 2018), results of the final analysis of all 570 patients including post surveillance data are provided. Results: Of the 570 randomised patients, 551 patients (352 AML; 199 MDS) were included in the full analysis set (268 treosulfan; 283 busulfan). Median age of patients was 60 years (range: 30-70) and alloHCT from MUD was performed in 76.4%. Frequencies of early adverse events and incidences of acute and chronic GvHD were largely comparable between the two regimens, while extensive chronic GvHD was numerically in favour of treosulfan (19.7% versus 26.7%; p=0.0750). Neutrophil recovery at day +28 was also comparable after both regimens, but complete donor‑type chimerism (day +28) was higher after treosulfan (93.2% versus 83.3%; p=0.0159). After a median follow-up of 29 months EFS was significantly in favour of the treosulfan arm (24-month rates: 65.7% versus 51.2%; hazard ratio [HR] 0.64; one-sided p=0.00058) as well as OS (72.7% versus 60.2%; HR 0.64; two-sided p=0.0037) and NRM (12.0% versus 20.4%; HR 0.63; p=0.0343). Notably, the RI was similar between both regimens (22.0% versus 25.2%; HR 0.82; p=0.2631). Consequently, treosulfan led to a significantly improved 24‑month GvHD-free and relapse‑free survival (50.3% versus 37.1%; HR 0.73; p=0.0087). 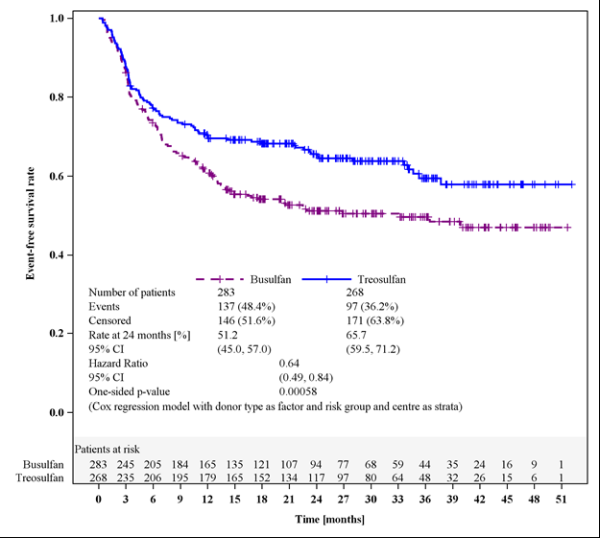 Conclusions: This phase III trial demonstrates a significant and clinical meaningful long term improvement of survival outcome after administration of the new treosulfan-based conditioning treatment compared to the RIC busulfan regimen. Although considered myeloablative, the treosulfan regimen demonstrated major improvement of NRM, which is not offset by an increase in relapse incidence in the AML/MDS patient population.